Don’t settle by buying an existing home that isn’t everything you want it to be. Building custom with us is quick and easy, and ensures you have a home perfectly fit for you life. Building new gives you full control of every aspect - location, style, size, layouts, colors, energy-efficiency and finishes. Our Sales Consultants and Design Coordinators work with you step-by-step to ensure your new home, inside and out, is designed to fit your life. While it can be hard to beat the immediacy of moving into an existing home, we think it's worth the short wait for your own new, custom home. Brookside's typical completion time is 6 months from the time ground has been broken - a small time to wait for a home perfectly fit for your life! Existing homes can be money pits, with homeowners spending unplanned thousands to repair or replace items. Building new means fewer unplanned and costly repairs. Brookside Homes' high-quality products are built to last and save you money, backed by a 1-year warranty on materials/workmanship and a 12-year structural defect warranty. Our team of professionals will work with you and offer guidance every step of the way. Purchase Land: We are an on-your-lot home builder. Already purchased a lot? Great! Still looking for the right piece of land? No problem, you can work with us while in the process of discovering and buying your lot. See what land is available in our build area. Consultation and Home Design: Our Sales Consultants and in-house Design Coordinators are attentive listeners and will work with you to select the home plan and features that best fit your life. Determine Pricing: No one wants to receive a large, unexpected bill during or after construction. Brookside Homes gives you pricing peace of mind from the start with our very detailed, no hidden cost Price Quotation. All items included in the build are clearly referenced and association with an accurate dollar amount – no risky handwritten pricing or high-level, consolidated descriptions making you guess as to what is/is not included and its cost. Pre-construction Site Visit: We’ll work with you to schedule a Pre-construction Site Visit with Owner Steve Wagner, or another Brookside Homes representative, on your lot to confirm site work costs and determine best location for the home on your lot. Obtain Financing: With pricing in-hand, you can obtain financing for your home from your financial institution. Don’t yet have a financial institution or want to shop around for the best rates? We’re happy to share with you a list of fine, local institutions we’ve worked with previously. Sign Contract: Once your financing is in order and you’re good to go with your Home Plan Design and Price Quotation, we’ll all sign the build contract so we can get started on building your home. Obtain Permits: Once you obtain the various permits (e.g., building, water, sewer, etc.) needed according to your various county, township and location requirements, site work can commence. Questions about completing permit applications? Don’t worry, we can help answer them! Excavation and Grading: Your home’s footprint is staked out with Owner Steve Wagner, or another Brookside Homes representative, and the excavator. The top soil, if any, is stripped and a solid driveway for cars and construction vehicles is established, the hole is dug and the site is prepped for the walls. Once the foundation is installed and ready, an inspector visits the site to ensure the foundation components are up to code and installed properly. This step generally takes 2-5 weeks, but can vary depending on weather conditions, inspector schedule and site issues such as water or hard rock under the chosen site. This big step is where your home really starts to take shape! Framing: The wall studs and walls are put up, floors/stories are created and windows and the roof system/shingles are installed. Once framing is finished, we conduct an inspection with the framer and another with the code inspector. General completion timeframe for this step is 2-5 weeks, but can vary depending on size of home, weather conditions and inspector schedule. Electrical, Plumbing and HVAC Rough-in: Once the frame of your home is finished, ductwork is installed for the HVAC system. Electrical conduit/wires and plumbing pipes are run through the interior walls, ceilings and floors. Additionally, sewer lines and vents, water supply lines for each plumbing fixture, and bathtubs and other large, heavy units that require room to maneuver are installed. If you are supplying any of your own fixtures, particularly special order items, it is important that you make your selections and order early so the fixtures are ready and available. Rough electrical, plumbing and mechanical systems then go through a code inspection. General completion time frame is 2-3 weeks, but can vary depending on inspector schedule and availability of any fixtures you are supplying. Utilities Hookup: Trenches for utilities and public water/sewer are created following this rough in stage. An inspection is also scheduled with you, the homeowner, at this building interval. Utilities Preparation: Depending on the specific utility needs for your lot, water/sewer, well, septic, fuel and electric are typically planned at this time, and may require additional time to complete. Please apply for power, gas, public sewer, and public water in advance. For example, if you are planning to use natural gas, it may take the gas company 4-6 weeks to complete your service request. As another example, if your home has an on-site well, the well water will need to be tested and pass a potability test prior to receiving the Occupancy Permit; some wells do not pass the first time or results may be delayed from the testing company that could delay your Occupancy Permit. We recommend doing the test as early as possible for these reasons. Insulation: Insulation helps keep your home quiet, comfortable and draft-free. Nu-Wool (R) Dense Pack Insulation is blown into exterior walls on all stories and the attic. This step generally takes 2-3 days. Drywall and Painting: Once the drywall is taped, spackled, and sanded, the primer coat of paint is applied. While this step generally takes 3-4 weeks to complete, weather and electricity are a major factor. Temperature and humidity conditions can affect the integrity of the drywall at this stage; therefore, prior delays in electric hookup can mean a delay in completion if not addressed promptly. Inspections will be scheduled as well at this stage. Concrete: Once the framing is finished, this step can occur at almost any time. Concrete is poured for the basement, garage and stoops/porches as per your home plan. This step is very weather dependent and can be delayed considerably during the winter months and cold temperatures; in some cases, concrete may be poured in the basement only and we will schedule a time to come back and finish pouring the garage and stoops/porches when the weather allows. Exterior: Install exterior finishes such as siding, decorative trim, stone facade, etc., per your home plan, in addition to the gutters, soffit and downspouts. As with the concrete pouring, this step can be completed any time after the framing, however for siding installation, we prefer that the landscape backfilling be completed first. General timeframe is 1-2 weeks, but varies greatly depending on weather. This stage is all about finalizing your home and readying it for the final code inspection, the Occupancy Inspection, and Brookside Homes’ Final Walk-through. Trimming: Install interior doors, baseboards, door casings, window sills, molding and other decorative trim. Kitchen and bathroom vanity cabinets are installed. General time frame is 3-4 weeks, but may vary due to product availability. Electrical and Plumbing Finish: Install the electrical and plumbing fixtures and light bulbs. General time frame is 2-3 weeks, but can vary depending on the availability of full and complete fixtures, particularly if you are supplying any of the fixtures. All fixtures and light bulbs must be installed in order to pass the Occupancy Inspection. Pre-carpet Finish: We’ll perform a light cleaning of cabinets and countertops, and sweep the floors. We do recommend you perform a more thorough cleaning prior to move in. Paint touch-ups are started at this time. Porch and deck rails will be installed if applicable. General time frame is 1-2 weeks. Carpet Installation: Install carpet (if applicable) and complete any remaining touch-ups. General time frame is 1-2 weeks. Occupancy Inspection and Final Walk-through: We’ll work with you to select a date and time to meet with Owner Steve Wagner, or other Brookside Homes representative, for the Final Walk-through. We will then schedule the Occupancy Inspection with the code inspector, typically 2-3 days prior to the Final Walk-through, in an effort to have the Occupancy Permit ready for you at the Final Walk-through. The Final Walk-through is an opportunity to acquaint you with the features of your new home and identify any items that may be of concern, generating a “punch list” of to-dos that, in most cases, are addressed that day or on the next business day. Your final payments or payment arrangements are also due at Final Walk-through. If final payment or payment arrangements are received/made, we’ll hand over the house keys and you may begin moving in, provided the Occupancy Permit was granted by the inspector. After you move in, our full-time Service Department staff will assist you with needs or concerns that may arise. They will automatically reach out to you for two, scheduled service calls, at 60 days and one year post-move in. All homes “season” over time, and some items like nail pops, may occur during this settling process, and, unless unusually pronounced, will be addressed at the end of year service. These two automatic service calls provide another opportunity for you to identify any items of concern for Brookside Homes to address specifically within that first year of home ownership. All of our homes are covered by a 1 year workmanship/material warranty and a 12-year structural warranty, administered and backed by an independent third-party to ensure fairness and transparency. Since joining the warranty program in 2007, Brookside Homes has had zero warranty claims! We truly build homes for life! Looking for land? Use our handy-dandy land finder to get a link to available lots in your area of choice. nearly all of Central PA and the southern tier of NY. 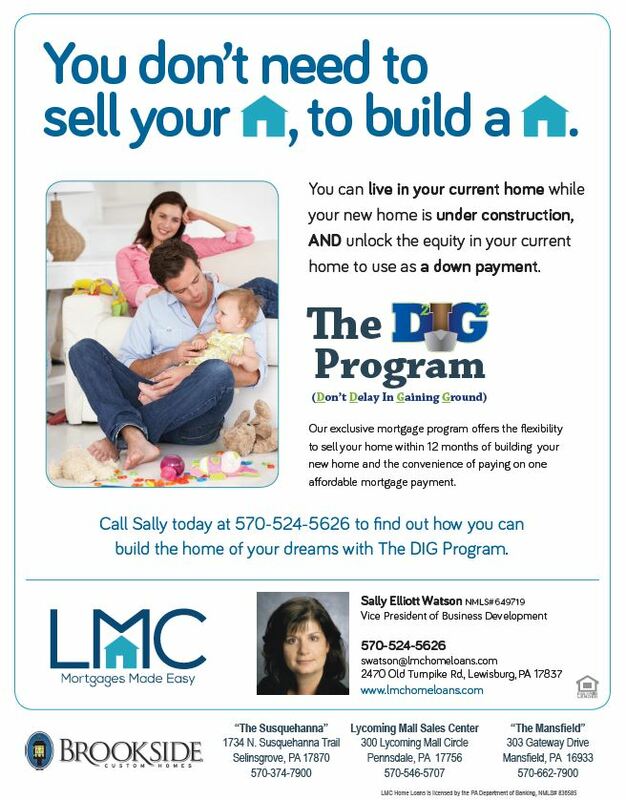 We work with some great local financing partners, who can help make the home of your dreams happen.